The New Bullitt X-S ! A redesigned and revamped version of the very popular Bullitt S.
All the same dimensions, but with a twist. The nose is longer with more entry rocker, but with less width and volume. The stern is narrower and slicier and with greater exit rocker making for a snappier feel. The original Bullitt S was a chopped down version of the IC Bullitt with the 'chopped' parts taken from the ends. This new design is largely the IC Bullitt, but with the 'chopped parts taken from the middle. So, is this a replacement for the S ?...no at all. The Bullitt S is a mainstay of the Mega line...very user friendly and excellent 'all rounder'....also a great instruction boat. We will continue to carry and sell this version. The new Bullitt X-S is a lot more of a slippery customer for the more aggressive 'competition' style paddler. We hope to have the Bullitt X-S on our next shippment. Some great shots from Richard D at Manhatten Beach. The boat is the Tiderace Xplore. 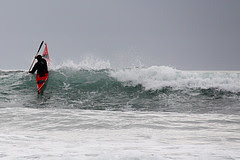 DW shows some sweet 'down the line' action in the 17ft 'surf kayak'. Matt Bouman extended his unbeaten run in the Discovery Men's Health surf ski series with an emphatic victory in the Island Tribe Scottburgh Surf Classic in tricky South Coast surf conditions. The popular surf ski race brought down the curtain on a hugely successful winter solstice festival weekend in Scottburgh that enjoyed balmy weather and huge fields for the trail run and mountain bike race on Saturday, and the surf ski race on Sunday. Yes, it is official. The first day of summer kicked off to a fine start yesterday with heat advisories telling people to stay indoors ! What ? We had a great day on the water yesterday, and with a cool ocean breeze fanning our necks it certainly did not feel like the 105' heat index (?) forecast. 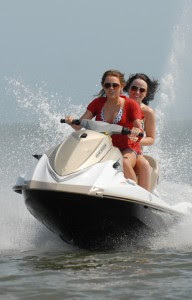 The ever environmentally conscious Miley Syrus was out jet skiing around the waters of Tybee earlier in the week, probably doing some high speed turtle research. In town for the summer for filming, Miley has set up camp on Tybee along with about 130 Disney employees. Tybee cops have already arrested 3 over-eager photographers for not "doing as they were told." TIPD has got your back, Miley. But of course the the days of summer also herald in the Season of the Boating Buffoon and plenty of buffoonery was evident on Little Tybee this last week also. 5 overly equipped but under knowledged fishermen were briefly stranded on Myrtle while attempting a surf landing or something ??. Their boat spilling gas and other junk was left high and dry on the sand. Fortunately surf is low due to our high pressure system right now. 4 Soldiers were left overnight on LT after being told by their buddie he would be back in the morning. Of course , he did not return and the hapless heros had to be rescued by Tybee Rescue services. They were each fined $85. A bunch of local kids drifted over to LT on inflatable mattresses and spent the night, before drifting back the next day. We found their beach camp along with their shot up bear cans in the fire. Nice kids, but dim. So, come on . Switch of the radio and TV and lets get to the beach. It will be a hoot.... we guarantee it . International Surfing Day will be celebrated on Tybee Island, Georgia tomorrow, Saturday, June 20th 2009. The event is being sponsored locally by the Surfrider Foundation Coastal Georgia Low Country Chapter, and will be headquartered on the beach near 17th Street (South Beach parking area). Throughout the day, from 10am til 5pm, a variety of activities are planned, and everyone is invited to come and take part and participate. As families struggle to put food on the table sharks too are finding it harder to get a bite to eat. University of Florida researchers who compile the annual tally of shark attacks on humans have said that shark attack figures are down to their lowest in five years, and are citing the recession as the reason. Apparently the recession means less people are taking holidays and swimming in the sea, therefore not coming into contact with sharks so often. The researchers remember a similar drop in attacks during the recession after 9/11. Of course, with over 700 million killed every year, there could just be fewer sharks ! SST's Normal for June - A Good Sign. 'The last half of June is usually one of the quietest portions of hurricane season. In the 14 years since the current active hurricane period began in 1995, only four tropical storms formed in the last half of June. None of those four storms since 1995 became a hurricane, and hurricanes are quite rare in June. Sea Surface Temperatures (SSTs) have remained close to average over the tropical Atlantic between Africa and Central America this month . These are the coolest SST anomalies we've seen since 1994. The strength of the Azores-Bermuda high has been near average over the past two weeks, driving near-average trade winds. Stronger-than-average trade winds were observed through most of the period November 2008 - May 2009, which helped cool the tropical Atlantic substantially. Strong winds mix up colder water from the depths and cause greater evaporative cooling. The latest 2-week run of the GFS model predicts continued average trade winds over the tropical Atlantic for the remainder of June, so expect the near-average SSTs to continue over the tropical Atlantic as we head into July. Typically, June tropical storms form over the Gulf of Mexico, Western Caribbean, and Gulf Stream waters just offshore Florida, where water temperatures are warmest. SSTs are 26 - 28°C in these regions, which is about 0.5°C above average for this time of year. June storms typically form when a cold front moves off the U.S. coast and stalls out, with the old frontal boundary serving as a focal point for development of a tropical disturbance. 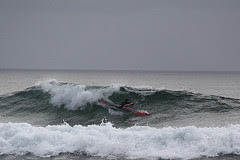 A sea kayak is an inter coastal vessel. It weaves a path along the boundary between earth and ocean in an environment full of great wonder and possible danger. The biggest fear for mariners has long been not so much the ocean, but the jagged shores on its fringes. Of course, we all know that whatever happens, sooner or later , one way or another, we will come ashore. And when we do, there's nothing quite like a nice cup of tea. But to enjoy this moment of reflection and contentedness through a libation, one does not have to go through the ringer, in fact far better not to. The motivation to make a crossing, a descent or a circumnavigation can be as simple as an excuse for a fine cup of tea in fresh surroundings and a clear view. So, go ahead. Load up your kayak, fill your flask and head out to another shore and take a moment for yourself. "Plant As If Life Depends On It"
presented by Linda Lamb, Director of Coastal Wildscapes. As urban development increases in our area, native habitat is lost to lawns and exotic ornamental shrubs. Pesticides, fertilizer and scarce water are poured on to keep these plants alive in what to them is a hostile environment. There is a way to mitigate the negative impact on our environment and our health...please attend our presentation on "gardening for biodiversity through conservation landscaping". Techniques which will help heal our landscapes will be discussed. The meeting will be held at the First Presbyterian Church, 520 E. Washington Ave, Savannah. PLEASE NOTE THIS IS A CHANGE OF LOCATION FROM PREVIOUS MEETINGS. Paddleboards are Vessels - Coast Guard. Title 1 United States Code, Section 3. This classification means that when used beyond the narrow limits of a swimming, surfing, or bathing area, no person may use a paddleboard unless in compliance with the Navigation Rules, and applicable carriage requirements for this type of vessel. This may include a Coast Guard approved life jacket for each person on board, a sound producing device, visual distress signals, and proper navigation lights. 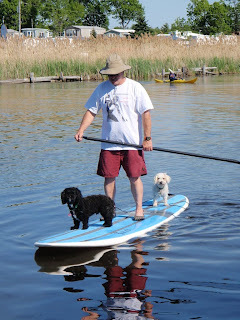 Director of the Oregon Marine Board, Paul Donheffner, reported that paddleboarding has been gaining popularity. Traditionally they were used to surf in the ocean, but are now being used not only in the ocean beyond surfing areas but also in lakes and rivers. It is important to note that paddleboards in the surf-zone will not be affected by the decision and that the Coast Guard does not define the limits of surf-zones. The Florida horse conch is the largest snail to be found in the American waters, sometimes reaching a length of two feet. It has ten whorls, and its shoulders bear large, low nodules. The operculum is a leathery brown color, the aperture is orange, and the animal itself is brick red in color. They are carnivores that feed on bivalves and other snails. 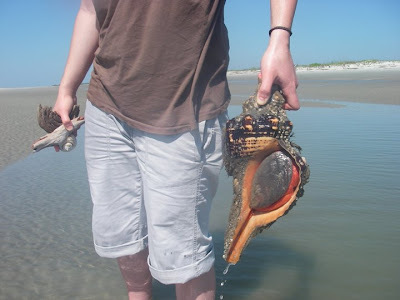 Florida horse conchs are used as food and are said to taste "peppery." Thanks Mike for the positive id and all who wrote in with suggestions. The other day over on Little Tybee we came across this monster of a snail lurking in a tide pool. We have never seen a Whelk (?) this big. Not sure what kind it is. The BLUE Ocean Film Festival is a global film festival and conservation summit for underwater filmmakers and marine researchers. Presented by the BLUE Ocean Film Festival. Passes can be purchased at the SCAD box office, 216 E. Broughton St., or at the door one hour prior to the event. A View From Below explores the world’s most unique submersible with maverick submarine builder and underwater explorer Karl Stanley. Shishmaref is a community of about 600 Inpiat Eskimo’s located on an island just off the west coast of Alaska. In the documentary director Jan Louter depicts the impending end of the traditional lifestyle on the island of Shishmaref through the lives of three Inupiat families. Despite the alarming situation, this film has not become a political manifesto. The Last Days of Shishmaref is a moving film about identity, transience, mortality and the clash between years and cultures. For six weeks Jon Bowermaster and crew take on a remarkable journey of exploration in the Antarctic Peninsula by sea kayak observing first hand the evolution of this most remote place. With ice shelves impacted by climate change Antarctica is also experiencing another kind of impact, a boom in tourism, which has lead to nations squabbling over who has claims to what as the ice steadily disappears. This National Geographic-sponsored exploration is a one-of-a-kind look at Antarctica from a unique perspective - sea level. Film followed by filmmaker Q & A. Sea Sprouts is two days of boating games and safety training. 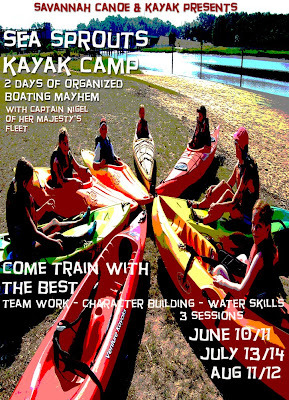 For Boys and Girls from ages 10-16 yrs the sessions are conducted at the Skidaway River. Each session is approx 3 hrs long and exceedingly wet. All boats and gear provided. $50 a day. 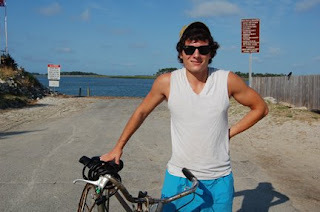 It was his life long dream to take part in the Little Tybee Challenge, but all too quickly Stephen Lockwood's vision of the future turned to the front end of a car cutting across his path. Just a day before the race, Stephen was out cruising along Butler in the Tybee bike lane (??) when, without warning, a car made a sudden left turn into the Ocean Plaza Hotel. With a look of horror on his face and cat-like reflexes Stephen rolled across the hood and into the windshield. "I'll have to call you back." were the last words of the driver before exiting her vehicle to check on young Stephen, now laying in the gutter surrounded by broken dreams...and a carbon fiber bicycle now in two halves. Mr Lockwood was later released from Hospital with stitches and some jaw problems. SC&K representative released the following statement..
"We are sorry to hear about this unfortunate accident and wish Stephen a full and speedy recovery. We would also like to congratulate him on his impact prevention techniques and ability to 'roll'. Well done mate !" 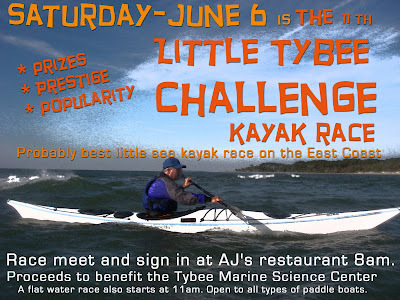 Raising over $11,000 for the Tybee Island Marine Science Center, yesterday's 11th annual Tybee Island Sea Kayak Race was a huge success! Thank you to all of the racers, volunteers, and sponsors for participating, and to Debbie Kearney for her efforts in organizing this fun community event. Great to see SC&K guides, Nick, Steve, Stephanie and Mike taking home trophies. If you want to get involved but, do not want to race there are several opportunities to help out. The Race Course needs several safety boaters. Paul Wolf will be at the helm of his motor boat at the half way point, but to prevent people from getting lost in the marsh and also assist with surf rescues on the front side, at least 5 kayakers are needed. If you want to help out get in touch with Deb Kearney, the Marine Science Center or drop us a line. Alas, we will not be able to take part in this years event, only the 2nd time in 9 years. We normally defer business from this day because all our guides and ourselves are at the race. However, this year we will not be able to do this. Good luck to all who take part. Over $15,000 was raised last year towards better education and preservation of our ocean environments. Call the Tybee Island Marine Science Center at (912) 786-5917.